It is one of the most iconic images - not just of our time, but of all time. The picture of the earth as seen from 28,000 miles (45,000 km) out in space - often called 'the blue marble' because it resembles the spherical agates we used to play with as children - was taken on 7 December 1972 by the crew of the spacecraft Apollo 17 (it is reproduced here). The Arabian Peninsula is clearly visible at the top, with the east coast of Africa extending down towards Antarctica, the white mass at the bottom. (The original picture was actually upside down from this view, but the picture is usually presented rotated as it is here).) For those who care about such things, the photo was taken with a 70 mm Hasselblad camera with an 80 mm lens. Apollo 17 was the last manned lunar mission, so no human beings have since been far enough out into space to take another picture that shows the whole globe. Because of the National Aeronautics and Space Administration's (NASA's) insistence on de-emphasizing the role of any one crew member in space missions, the photograph is credited to the entire flight team: Eugene Cernan, Ronald Evans and Jack Schmit. It is still not known for certain who actually took what might be the most famous photograph in the history of the medium. Photographed by Eugene Cernan, Ronald Evans and Jack Schmit. The timing of the picture was auspicious, to say the least. 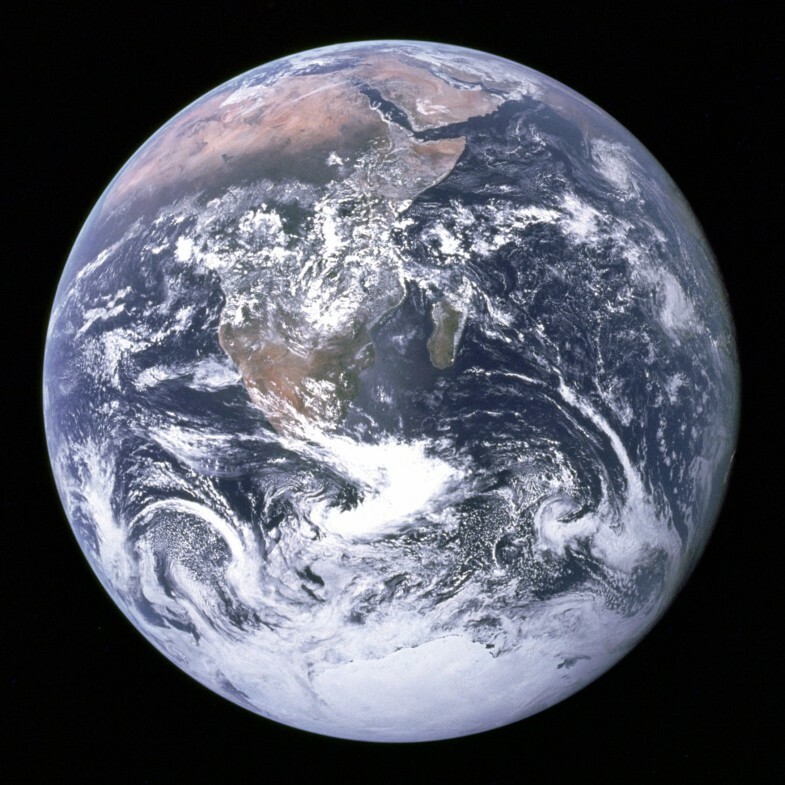 The early 1970s marked the beginning of an era of environmental activism in the US, and the blue marble Earth photo, being the first ever taken of an illuminated face of the entire planet, rapidly became a symbol of the movement. It's easy to see why. Our whole planet suddenly, in this image, seemed tiny, vulnerable, and incredibly lonely against the vast blackness of the cosmos. It also seemed whole in a way that no map could illustrate. Regional conflict and petty differences could be dismissed as trivial compared with environmental dangers that threatened all of humanity, traveling together through the void on this fragile-looking marble. I had occasion to use this picture in a talk I gave recently, and it got me thinking about the power of images. The word 'iconic' is often used for pictures like this one, and it fits. The word means, of course, to be like an icon, which is a symbol that perfectly represents something other than just itself. The blue marble was an iconic image because it perfectly represented the human condition of living on an island in the universe, with all the frailty an island ecosystem is prey to. People are particularly moved by images, in part because we have evolved to have our visual system as our primary sensory input, but also because an image can be retained easily in the mind's eye, and so forms the stuff of memory. The right image, offered at the right time, can have effects far greater than those imagined by the one creating it. Consider another picture that changed the world: the famous photograph of the German dirigible Hindenburg bursting into flames on 6 May 1937, in the skies over the Lakehurst Naval Air Station in New Jersey. It was that photo, more than the scale of the disaster - 36 people were killed, mostly from jumping to escape the fire, but 62 survived by staying on board as the burning blimp floated to the ground - that spelled doom for the graceful zeppelins that almost filled the skies during the period between the two world wars. Even nowadays, when the substitution of helium for hydrogen would mean that a similar conflagration would be impossible, the power of that picture has prevented the revival of lighter-than-air craft as passenger carriers, relegating them to advertising vehicles hovering over sporting events despite their environmental friendliness. Another iconic image comes from a time of great turbulence, when student protests over the Vietnam war erupted into violence on many college campuses. On 4 May 1970, in the city of Kent, Ohio, a group of Ohio National Guard soldiers opened fire on a group of unarmed students from Kent State University. Four students were killed and nine wounded, one of whom was paralyzed for life. The photograph that came to symbolize the entire student movement and the official overreaction to it was taken moments later by John Filo, a photojournalism student. It shows a 14-year-old runaway from Florida, Mary Ann Vecchio, who had joined the protests that day, kneeling over the body of 20-year-old Jeffrey Glenn Miller, who had been shot dead. Vecchio is screaming in anguish, her arms flung outwards like a figure in a Victorian mezzotint. That picture won John Filo the Pulitzer Prize. He eventually became a picture editor at the weekly news magazine Newsweek, and is now on the staff of the communications department of CBS television network. Mary Ann Vecchio went back to Florida (involuntarily), married, and later moved to Las Vegas where she currently works as a respiratory therapist. In 1995, at an event at Emerson College in Boston, Massachusetts, commemorating the 25th anniversary of what became known as the Kent State Massacre largely because of that photograph, she met John Filo for the first time. I'm sure you can think of many more examples of images that have the power to alter events (there's even a website for many of them: http://www.famouspictures.org). I'll just mention one more, another Pulitzer winner: the photograph, taken by Associated Press photojournalist Eddie Adams, on 1 February 1968, of South Vietnamese General Nguyen Ngoc Loan in the act of executing Vietcong operative Nguyen Van Lem by a pistol shot to the head. That picture drove home to millions of Americans, in a way that no words had been able to do, the stark brutality of that war. Ironically, despite being demonized around the world because of that image, General Loan - who was acting legally according to the laws of South Vietnam in executing an enemy who had been captured not wearing a uniform - was considered a hero by his people. Later that year he was wounded in action, and after the war ended in 1975, Loan settled in the US and became a pizza cook in northern Virginia. Eddie Adams, who died of Lou Gehrig's Disease in 2004, had this to say about the photograph that made him famous: "The general killed the Viet Cong; I killed the general with my camera. Still photographs are the most powerful weapon in the world. People believe them, but photographs do lie, even without manipulation. They are only half-truths. What the photograph didn't say was, 'What would you do if you were the general at that time and place on that hot day, and you caught the so-called bad guy after he blew away one, two or three American soldiers?' General Loan was what you would call a real warrior, admired by his troops. I'm not saying what he did was right, but you have to put yourself in his position." When Nguyen Ngoc Loan died of cancer in 1998, Eddie Adams sent flowers. Science, of course, has its own icons. The mushroom cloud that came to stand for the atomic age, with all its potential horror. Any picture or caricature of Einstein, with that halo of hair and casual appearance he so carefully cultivated (he once wrote "photographer's model" for 'occupation' on a form, perhaps not in jest), which has become synonymous with the very idea of genius. But perhaps the most interesting one comes from the dawn of genomics: the double helix. I don't know if Watson and Crick understood from the beginning that the symmetrical beauty of the structure of DNA was almost certain to make them far more famous than many other people who had made equally important discoveries that could not be understood so easily, but that's certainly the way it turned out. Unfortunately, none of these science-related images will do for us what the blue marble did for environmentalists - galvanize an entire generation. Right now, science is at an historically low ebb in public estimation. Years of carefully orchestrated attacks by the religious right and other anti-science organizations, combined with public-relations and ethical blunders on the part of some scientists, have led to science being regarded by many lay people as just another collection of self-serving, commercially oriented egoists. We haven't had a universal triumph along the lines of Jonas Salk's polio vaccine in quite some time, and the ones we have had (for example, AIDS and many cancers are no longer inevitably fatal diseases, at least in the developed world) have not been publicized the way they should have. There are many things we can and should do to fight this trend, but one of the most effective is one I haven't heard talked about: finding our own, new iconic image, one that would serve to capture, and make obvious, the enormous value that science brings to the human condition. It ought to be possible: biology is becoming very visualization-oriented, with new imaging techniques offering undreamed-of resolution into the inner workings of the cell. Genomics has led to a plethora of metaphors (the genome as Rosetta Stone or encyclopedia, for instance) that conceivably could serve as the basis for a powerful symbol. And the world is filled with people who are alive today only because of the discoveries of basic researchers and the efforts of physicians and pharmaceutical/biotechnology companies to translate those discoveries into treatments and cures. The problem is that all of the images I've talked about in this essay were unplanned. They were not intended to be iconic; they came about purely by chance. Either the right person was there at the right time and the moment had so much power that symbolism instantly became attached to the picture, or else the image itself had a power all its own (born of simplicity, perhaps, as in the case of the double helix) that made iconic status inevitable, even when not immediate. Maybe that's the way it has to be. Maybe people have become so cynical and media-savvy that they can only be moved by something possessing the authenticity of accident. Probably we can't - and shouldn't - just design the image we think we need and try to foist it on the public. But we can still be on the lookout for the right image to come along, for our big blue marble, so that when it does, we will know it.